First of all, what is gamification? The word does not sound so serious right? It’s like… Shall you have fun at work? Who said that? I know that we all want to have fun all the time if we had the chance to choose. And we do have, that’s the best part of being human. In short gamification is a way to add things and psychological ideas to make things more fun. Let start by look at our job situation. Tasks in our daily work is mostly repetitive but dull. Goals in our daily work can be unclear, information often delivered at the wrong time. Failure is often forbidden, you don’t talk about it to often and you can get punished by your failure. Collaboration is often bad (not always but we tend to think that people who talk to much aren’t productive. ), the autonomy is mid or low. The path to mastery is often unclear. How do I master? What way do I need to go to get from good to great or enter next level in my carrier at my work? So what about games? Tasks are repetitive but often fun right? Yatzy is fun, we do the same thing over and over again and still play it. The goal is really clear, the one that get most points is the winner, it’s clear how to play, and what you need to do. The information is delivered on time (just in time). Failure is ok, if you don’t fail you can’t win. You don’t get punished if failing. Collaboration is there, you have fun, talk to each other, maybe even give each other some tips what dice you shall save or not, get better ideas regarding how to play Yatzy better and master it more. We know all this, we have known this since the day we invented games, but why don’t we take all this knowledge and implement it in our daily work? The answer is kind of simple, we need to collaborate and understand people in our organisation first to do so. We really need to communicate outside our boundaries of daily work. How many of you colleagues know that you like sport? But in general you love sport because you can help others to master it? How many of your colleagues love to draw, or learn by doing? How many of your colleagues sees the world by how the world sounds like rather then how it looks like? How many of your friends has emotion based on movies rather then politics? When you talk to your friends regarding trees, can it sound like this from different peoples? I love this wonderful sound in the trees. I love the green color on the trees. I love how the leaves feel like in my hand. I love the feeling to get rid of dead trees. This is four different personalities. They all get knowledge in different ways, they all have different ways to communicate problems and so on. We often don’t see this because we are so busy in our own lives. If you play a game as a team you need to understand each other to have the possibility to win. And to do this you must learn to listen to each other and coach each other to mastery. This is one of the main ideas of the agile framework scrum. The American Soccer is the main idea of scrum. You must play as a team with each other to win. To do this you have a coach; a person that sees what you don’t see on the filed. The coach is there to help you get your minds and visions together. Makes you play the game together as a team. Some of you are better at running, others better at tackling and so on. You need to know this and put right person on the right job on the field to succeed. You collaborate for success. And therefore you also have a chance to win. Many coachers use games in the start-up meeting as the “learn to know each other socially”-process. Who are you in real life and so on. It’s easy to add this “worker role”-role in you at your work and forget the real life-role. You are often another kind of person out side your job. It’s important to get knowledge about that person as well. If not you become a hidden status user. Who are you to blame me? You don’t even know me. In gamification we have four main player types and they all act different at work and in life. You got the Killer. This one is the person that needs a winner and a looser. If there is no looser you haven’t win anything. We got the achievers, they are like the killers but the main different is that achievers don’t care if some one loses, the achievers just want to be better and need everyone to help him/her. We have the socialiser, the people that love to be around other peoples. Did you know that 80% of the persons on this planet are the socialisers? Did you even know that if you put a person in prison you rather be with the other insane criminals than alone in a room, even if we know it’s dangerous? The last player type is the explorer. The explorer is a person that love to see new things, how it looks like, the roadmap, the path even explore how it went. If you think of the persons in your team, can you group them by those four games types? I bet you can, think about it for a while. Hey… I told you to think about it so stop reading for some minutes, just reflect on your teammates and see what kind of persons they really are. As a agile coach you can take this knowledge and add more items to your methodology framework to make the work more fun. Add a score board for the killers and achievers. Make the socialiser collaborates ideas around this score board. Let the explorer, explore the result. Add a team vision and goal charts on the wall to make the goal more clear. What’s the most important values for the team to succeed? If the team loose focus go to this team goal chart and refresh the main goal and why the values are so important for you as a team. Make the collaboration a rule rather than a punishment of some kind of time-consuming issue. Because it’s not. Maybe all persons in the team love music and work better with music on? What if they all love the “focus playlist” on Spotify? Why not add a speaker in the room and play it in the background for them? I bet you have more fun playing games or party with friends with music in the background right? We love music. Think of a gym with no music… will you perform better? At the start up meeting let everyone create their own personas profile. Hang it on the wall with nicknames and an avatar. In this personas profile add interests, movies, music styles etc. 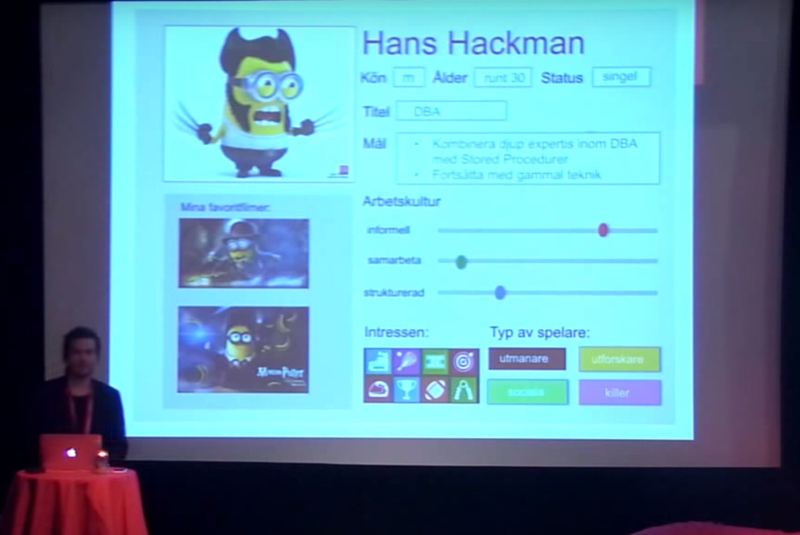 (Image: this is from my Keynote I did with the same topic 2015 at SweTugg conference). When working with customers you probably identify the personas to make better result for the customer, why not use the same ideas to make better result as a team? It’s no difference just that you suddenly get some focus. Focus that generate flourish (positive psychology). When a new team member enter the team, show him/her this wall, describe the teams goal and values and add this new person personas to the team-wall so others can see it. (Maybe he is the main healer you always wanted? 😉 ) If you feel that you are in a conflict with someone, just go to the wall look at the personas profile and think why you see things different, enter the personas personality to reflect and act different regarding the conflict. It’s fun, maybe it will scare you, but games that add some drama and scary moments are more fun than games you will win all the time without any resistance. Use user stories or something that the whole team feels gives them the best information regarding what to do with each task. Add story points and use that for the score board to reach high scores together if most of the people are killer and or achievers. And so on, be creative. To work shall be fun and successful. Can we use IoT (Internet of Things) with Lean UX?